It's not easy for me to find a men's t-shirt with designs I like, and I am not a big fan of pattern heavy shirts. When I noticed this brown eagle t-shirt by Liquid Blue at Target I took a closer look at it. While the image of an eagle on the chest looked pretty cool it was a tad too big for my taste. However I didn't have a T-shirt like this and it's great to wear over long sleeve T-shirt, so I bought it. 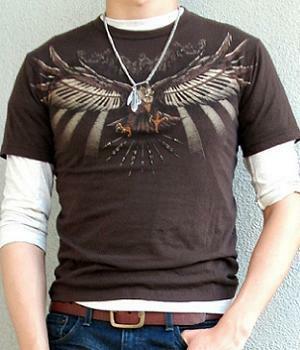 This short sleeve t-shirt has a nice brown color that matches the feathers of the large eagle depicted on the chest. The eagle spreads out its wings and talons menacingly as if getting ready to strike at any moment. There appear to be traces of light coming from behind the eagle just to reaffirm its strong presence. The art is detailed and not too showy so it's perfect. By the way BROWN color matches GOLD color very well. On its own this brown cotton t-shirt may not be impressive, but when I wore it in front of the mirror I realized that this t-shirt goes well with underlying long sleeve t-shirts in beige, white, or black. Other colors such as yellow, orange, and red are great as well. I also put on my eagle necklace (either the eagle wing pendant or the eagle feather pendant) as a fitting complement which really turns this T-shirt into a great casual one!! BUY this brown t-shirt NOW b4 they run out!